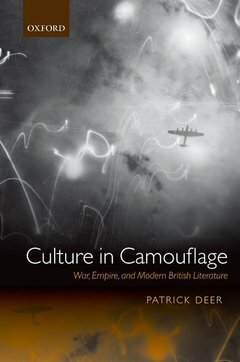 The British state and war machine struggled to produce a fully modernized and persuasive war culture in two world wars by freely cannibalizing art and literature. Deer explores writers' attempts to find their perspectives on the action in the face of the shattering violence and alienation of total war and an overpowering official war culture. Introduction. 1. From the panorama of battle to the labyrinth of total war: British war writing, 1914-1929. 2. The Empire of the Air: British Air Power and the Second World War. 3. Culture in the Blackout: Living Through the Blitz, 1940-44. 4. Ghosts inside the 'island fortress': Graham Greene, Elizabeth Bowen, and the Haunting of the Home Front. 5. 'When in a year collapse particular memories': the battle over culture and memory in Second World War writing. Conclusion. The Boom Ends: The war on the British literature of the 1940s. Bibliography. Patrick Deer teaches in the English Department at New York University. His teaching interests include 20th-century British literature, war culture, modernism, postcolonial literature and theory, Anglophone literature, cultural studies, the novel and film, critical theory, and gender studies. He is Guest Editor of 'The Ends of War', a Special Issue of Social Text (2007) vol. 25.2., and Co-Editor, with Gyan Prakash and Ella Shohat, of 'Reflections on the Work of Edward Said: Special Issue', Social Text 87 (2006) vol. 24.2. His published work also includes, 'The Dogs of War: Myths of British Anti-Americanism', in AntiAmericanism, edited by Andrew Ross and Kristin Ross (New York University Press, 2004), and 'Defusing the English Patient', an essay on the film adaptation of Michael Ondaatje's novel commissioned for A Companion to Literature and Film, edited Robert Stam (Basil Blackwell, 2004).